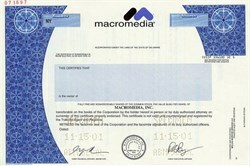 Beautiful specimen certificate from Macromedia, Inc. This historic document was printed by the Security - Columbian Company and has an ornate border around it with a vignette of the macromedia company logo. Macromedia was an American graphics and web development software company (1992–2005) headquartered in San Francisco, California that produced such products as Flash and Dreamweaver. Its rival, Adobe Systems, acquired Macromedia on December 3, 2005 and now controls the line of Macromedia products.